It has almost been a month since my year long ready to wear fast was completed, and I am here to report that the first thing I bought was pajamas. Flannel pajamas from Victoria Secret. They were on sale for like 20 bucks, and VS flannel pajamas are the best. The flannel is so soft and light. The fit is comfortable. They are not too big nor too small…they are just right. No use making them when you can find ones you love at a good price. Right? What is hard to find at a good price is nice workout gear. Running clothes are ridiculously expensive (as well as cycling and swimming clothes). Finding the right fabric to make workout clothes is not easy either, and the pattern selection is often lacking. Whenever I see fabric that would work for running or cycling clothes I buy it, usually several yards of it. Eventually the fabric makes it into workout clothes. I used Kwik Sew 3567 to make this running top. 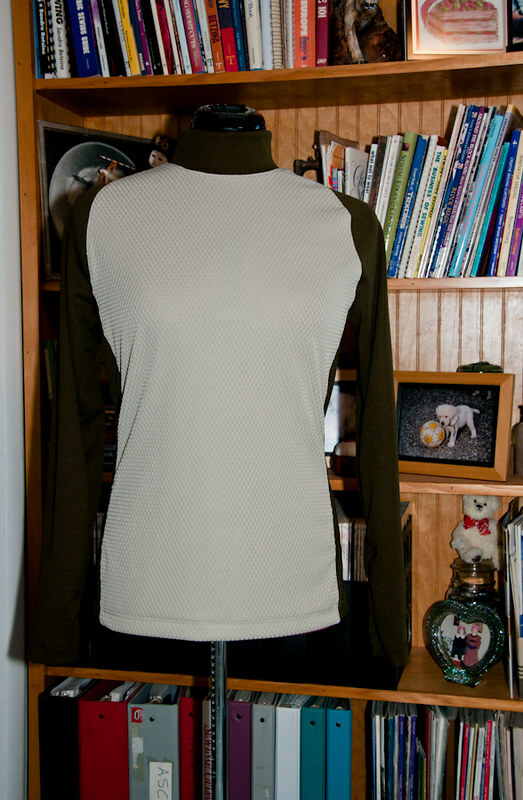 I needed something that was warm enough for cool weather, but not as warm as my merino wool base layer top which gets lots of wear this time of year. The main fabric is Nike Dryfit that I bought from a fabric co-op and the dark fabric is a wicking fabric that I picked up as a remnant from Outdoor Wilderness Fabrics. 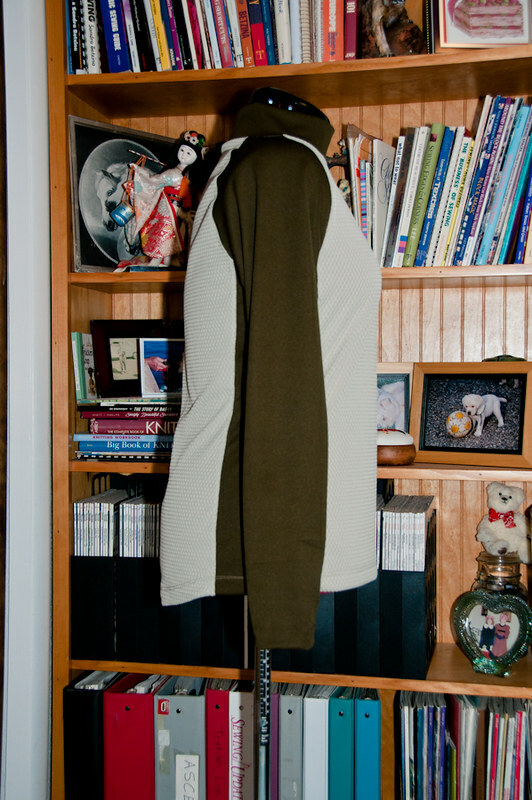 The Kwik Sew pattern is for stretch knits with 35% stretch and it is a close fitting top. I made view A, size medium. The pattern is a really quick sew. I used a combination of my sewing machine and my serger. All the seams are serged with woolly nylon in the loopers and then topstitched with my sewing machine. 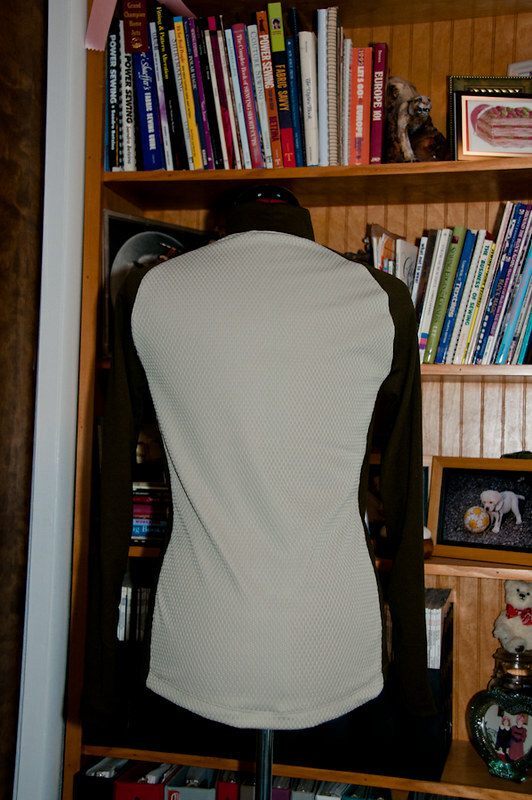 I like my workout tops longer in the back then the front, so I added an inch to the back and rounded it up to the side seams. I am really happy with how it turned out. I love the side panels and the raglan sleeves. I plan to make up a few more of these. Yesterday, right after I took these pictures, I took it out for a test run. I performed nicely. I think it will fit the bill for late winter/early spring running. I can also see adding a back pocket to this pattern for a cycling top. Do you sew active wear? If so, where do you find your fabric? Previous Post The Lola Dress, AKA what I will wear all Christmas break…..
Gosh I wish I knew how to sew! As a “tall” girl workout/cycling tops are never long enough. You did a great job!!! I should take you up on that some time…time??? What’s that? *sigh* Just not enough hours in the day!!! I love the raglan sleeves also. When exercising they don’t seem restrictive. I have made yoga pants and Tee shirts, but I can use a more common fabric for those – just as long as it is still stretchy! You top looks good! I don’t think I’ve done zippered pockets on stretch fabrics, but I assume you need lots of interfacing! I buy a lot of white fabric from Michael Levine. He has 20% off sales at major holidays. The quality of the fabric is great and the prices are actually very good.